A team of students from the College of Computing and Informatics (CCI) took the top prize - $10,000 cash and a $500 credit from Amazon Web Services - at the 2018 University Fintech Hackathon. The CCI squad developed WADS, a multi-dimensional platform that allows cryptocurrency users to pay for goods and services without lengthy wait times and high exchange fees. For three months and through several elimination rounds, the CCI squad competed against more than 150 students on teams from Duke, Elon, Appalachian State, Davidson, NC State, UNC Chapel Hill and Wake Forest to become one of three finalists at the Southeast Fintech Ventures Conference (SFVC). In addition to facing months of work, presentations and risk of elimination leading up to the finals, competitors were asked to solve a real-world problem and express creativity while developing a unique solution using the latest technologies. Embracing the challenge as a project in its Blockchain System Architecture Course, the team of Jonathan Byrne, Lukas Gupta-Leary, Loi Fung, Liam Byrne and Luke Deviney was advised by adjunct professor Atif Farid Mohammad, a senior data scientist with Catasys and chief scientist advisor with NAiTech specializing in Blockchain and Artificial Intelligence. "WADS helps bridge the gap where cryptocurrency viability faces a huge amount of skepticism," said Priyanka Sharma, Mohammad's teaching assistant. "It's innovative, and the business model is well-defined." 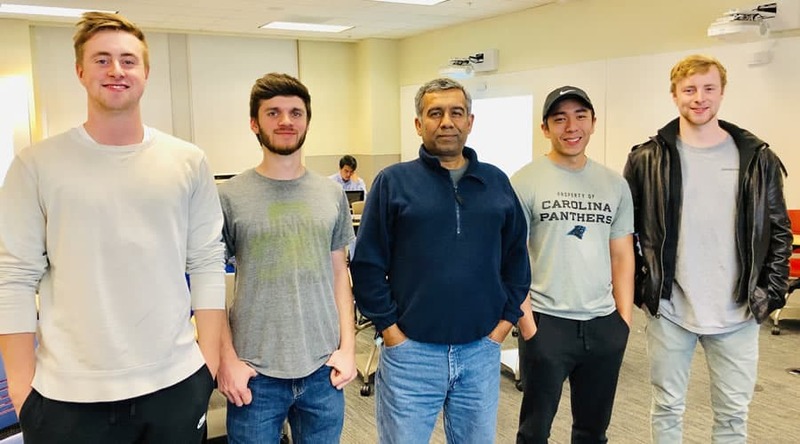 Presenting WADS (think: wads of cash) from the main stage as finalists at the SFVC, an annual gathering of industry leaders, the team faced off against another UNC Charlotte crew and a team from Davidson before the judges awarded the top prize. In fact, the team is continuing its work on the WADS platform, pursuing a partnership with a credit issuer to gain access to its application programming interface (API) and have WADS ready for an official launch early in 2019.